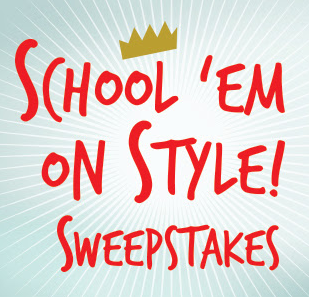 Land O’Frost “School ‘Em on Style” Sweepstakes – Win a $500 Visa gift card! Win a $500 Visa gift card (5 winners)! ENTER SWEEPSTAKES HERE – Land O’Frost Sweepstakes page. ENTRY LIMIT – Limit one (1) Sweepstakes entry per Day over the course of the Sweepstakes Period per person, Facebook account, email address or account, regardless of means of entry. ELIGIBILITY – Participation open to legal residents of the fifty (50) United States and District of Columbia who are 18 years of age or older at the time of entry. SWEEPSTAKES ENTRY PERIOD – Sweepstakes begins at 12:00:00 PM (ET) on July 24, 2016 and ends at 11:59:59 PM (ET) on August 20, 2016. PRIZES – Five (5) Grand Prizes: $500 Shopping Spree awarded in the form of a $500 Visa Gift Card. Each Grand Prize consists exclusively of: one (1) five-hundred-dollar ($500) Visa Gift Card. Gift card is subject to the terms and conditions of the issuer. Approximate retail value of each Grand Prize is: $500. 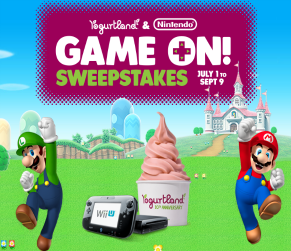 Yogurtland Presents: Super Mario™ Super Star Sweepstakes – Win Wii U & more! Win a Wii U & more! ENTER SWEEPSTAKES HERE – Yogurtland Sweepstakes page. ENTRY LIMIT – Entrants may enter a Sweepstakes only one time per day per email address. ELIGIBILITY – The Game is open to legal residents of the United States (including the District of Columbia and Guam) ages 13 years and up. SWEEPSTAKES ENTRY PERIOD – The Yogurtland Presents: Super Mario™ Super Star Sweepstakes is a series of 10 individual, sweepstakes periods running consecutively starting with the first sweepstakes period which begins on July 1, 2016 at 7:00 a.m. EDT and concludes on July 10, 2016 at 11:59 p.m. EDT. The second and subsequent Sweepstakes Period will each begin at 7:00 a.m. EDT the day after the previous sweepstakes ends and will end at 11:59 p.m. on the sixth day after it has begun; except for the tenth and final Sweepstakes Period, which will end on September 9, 2016 at 11:59 p.m. EDT. PRIZES – One (1) Grand Prize will be awarded per each of the ten Sweepstakes Periods. Each Grand Prize consists of a Wii U system, a Wii U game chosen at Sponsor’s discretion, and one year of free Yogurtland® frozen yogurt (based on 10 oz. of yogurt, 2 times a week, for 52 weeks). Approximate Retail Value (“ARV”) of each Grand Prize is $858.99. Grand Prize Winners will receive their yogurt prize in the form of a gift card. b. Ten (10) Daily Reveal Prizes will be awarded each day of each Sweepstakes Period, based on randomly selected times in the Reveal portion of the Sweepstakes. Each Daily Prize consists of a Yogurtland® unlimited cup of free frozen yogurt. ARV of each Daily Prize is $9.00. Odds of winning a Daily Reveal Prize are dependent on the number of entrants for that day. Sixteen (16) Wii U or Nintendo 3DS video games. ARV of each game will be either $39.99 or $59.99 dependent upon which game is won. One (1) New Nintendo 3DS XL video game system and one (1) Nintendo 3DS video game. ARV of each bundle pack is $259.98. 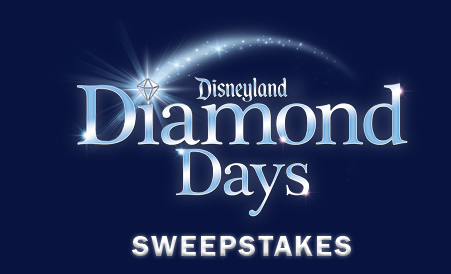 Disneyland Diamond Days Sweepstakes – Win a trip to Disneyland & more! Win a trip to Disneyland & more! ENTER SWEEPSTAKES HERE – Disneyland Sweepstakes page. Find the word of the day here. ELIGIBILITY – Open only to persons, who are: (i) as of the time of submission of an entry not minors as defined by their state/province/territory/country of primary residence; (ii) as of Entry and time of acceptance of any prize, a legal resident of, and physically located within, the 50 United States, D.C., Canada (excluding Quebec) or Mexico; (iii) for entry into the Daily Sweepstakes. SWEEPSTAKES PERIOD – Sweepstakes starts 7:00 AM PT on 2/5/16 and ends 6:59 AM PT on 9/9/16. An experience package for Winner and up to three (3) guests for redemption on the day awarded which will consist of: one (1) meal at a Resort restaurant, services of a VIP tour guide for up to seven (7) hours (subject to Resort operating hours), reserved viewing for select shows and parades as selected by Winner from a Sponsor provided list, and up to four (4) Disneyland® Resort 1-Day tickets as necessary to enjoy both Theme Parks that day (based on any Theme Park admission that the Winner and his/her guests may already have for that day). If a Daily Prize is awarded to a Canadian resident, such Daily Prize will also include a cash amount between $240.00 and $693.00, based on whether the Winner is provided with Theme Park tickets, which cash amount will be withheld to help defray his/her payment of taxes payable as a result of winning the Daily Prize (see below for more information about taxes, including the potential of necessary payment of taxes prior to being awarded a Prize). Details of the Daily Prize elements shall be determined by Sponsor in its sole discretion including, without limitation, restaurant, tour guide, duties of the tour guide, number of shows and show times. Any meal costs over $60.00 per person will be the sole responsibility of Winner. If meal costs are less than $60.00 per person, the difference will not be awarded. Winners must be present at the Resort to claim a Daily Prize and the inability to claim and redeem a Daily Prize on the day awarded will result in the forfeiture of the Prize, which will be awarded to an alternate Winner, time permitting. Approximate retail value (“ARV”) of the Daily Prize without tickets: $560.00 (if you are a U.S. resident) or $800.00 (if you are a Canadian resident). ARV of the Daily Prize with four (4) tickets: $1,180.00 (if you are a U.S. resident) or $1,873.00 (if you are a Canadian resident). Weekly Prizes (“Weekly Prize(s)”): Thirty-one (31) Weekly Prizes. Each Week, one (1) of the below Weekly Prizes will be awarded, and Sponsor shall determine the specific Weekly Prize to be awarded in any given Week. The specific Weekly Prize will be announced at http://www.Disneyland.com/DiamondDays before the applicable Weekly Entry Period for such Weekly Prize. [a] One (1) Dazzled Mickey Mouse Ears Package. This Prize package consists of one (1) Mickey Mouse ear hat adorned with crystals and a white gold plated, silver emblem consisting of a large topaz and smaller pavé diamonds for Winner and one (1) three (3) day/two (2) night trip (“Trip”) to the Resort for Winner and up to three (3) guests (collectively, the “Group”) consisting of: (i) up to four (4) round-trip coach class airfares between the major metropolitan airport closest to Winner’s residence and the Southern California airport as chosen by Sponsor (with possible layovers), provided, however, if the Winner resides within 250 miles of the Resort, air fare will not be provided; (ii) up to four (4) round trip ground transfers between the Southern California airport and the Resort, provided, however, if the Winner resides within 250 miles of the Resort, transfers will not be provided; (iii) up to four (4) 3-day Disneyland® Resort Park Hopper® tickets (subject to restrictions); and (iv) room accommodations consisting of one (1) standard room (with a maximum of four (4) persons) for two (2) consecutive nights at a Resort hotel, as selected by Sponsor in its sole discretion. ARV: $33,832.00. The Radio Flyer 25 Days of Holiday Giveaways Sweepstakes – Win Radio Flyer products! Win Radio Flyer products (a new prize will be awarded each day of the sweepstakes)! SWEEPSTAKES ENTRY PERIOD – Sweepstakes will commence at 12:01 a.m. Central Standard Time (“CST”) on November 27, 2015 and end at 11:59:59 p.m. CST December 21, 2015. 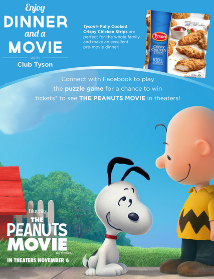 PRIZES – There will be one (1) grand prize awarded for each day consisting of a Radio Flyer product. The approximate retail value of the toy is listed on the 25 Days calendar on radioflyer.com. 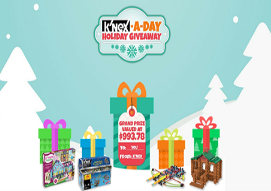 K’NEX-a-Day Holiday Giveaway Contest – Win a K’NEX prize pack worth over $900! Win a K’NEX Prize Pack worth over $900! ENTER SWEEPSTAKES HERE – K’NEX Facebook page. ENTRY LIMIT – Each entrant is limited to one entry per person per calendar day. age or older (for U.S. participants), or have reached the age of majority in his or her province of residence (for Canadian participants), at the time of entry; (b) have access to the Internet; and (c) have a Facebook® account. SWEEPSTAKES ENTRY PERIOD – Sweepstakes begins Monday, Nov. 23, 2015 and ends Dec. 14, 2015. 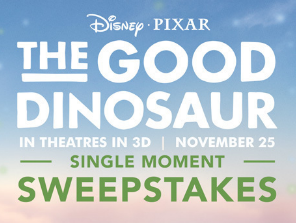 Disney The Good Dinosaur Single Moment Sweepstakes – Win a trip to Walt Disney World! You will need a Disney Go account to enter. ELIGIBILITY – Open only to persons, who are, 13 years of age or older, and who are legal residents of, and physically located within, the 50 United States, D.C. or Canada (excluding Quebec). SWEEPSTAKES ENTRY PERIOD – You may enter this Sweepstakes via the internet during the period beginning at 9:00 AM, November 16, 2015 and ending at 11:59 PM, December 31, 2015. PRIZES – ONE (1) GRAND PRIZE: Prize is in US Dollars. One Grand Prize winner will receive a five (5) day / four (4) night trip for Winner and up to three (3) guests (individually, “Guest,” the Guests and Winner shall collectively be referred to as the “Group”) to Orlando, Florida to visit Walt Disney World® Resort near City, consisting of the following elements for the Group: [a] hotel accommodations (one (1) standard room/quad occupancy, including room tax) for four (4) nights at a Walt Disney World® Resort hotel selected by Sponsor in its sole discretion; [b] if Winner’s residence is located more than two hundred fifty (250) miles from City, round-trip coach air transportation (with possible layovers) for the Group on a Sponsor-selected carrier between a Sponsor-selected major metropolitan airport near Winner’s residence (“Airport of Origin”) and Orlando International Airport; but if Winner’s residence is located two hundred fifty (250) miles or less from City, then air transportation or any other form of transportation will not be provided to the Group, [c] round trip ground transfers between the Orlando International Airport and the Walt Disney World® Resort via Disney’s Magical Express Service when air transportation is provided; [d] four (4) 5-Day Magic Your Way® Tickets with Park Hopper® Option; [e] services of one (1) Disney VIP Guide for eight (8) hours on one (1) day; [f] choice of any Disney PhotoPass™ Service products with a value up to US$300. A Disney Gift Card will be provided. Subject to restrictions; [g] one (1) Disney Signature Dining experience for four (4) persons with a value up to US $250. A Disney Gift Card will be provided. Subject to restrictions; [h] one (1) US $500 Disney Gift Card. Subject to restrictions; and [i] one (1) Disney’s Magical Celebration In-Room decor in the Walt Disney World® Resort hotel room. Approximate Retail Value (“ARV”): US$8,224.56, which will vary depending upon point of departure and seasonal fluctuation of hotel rates and airfares. Travel for Grand Prize must be booked by December 31, 2016. 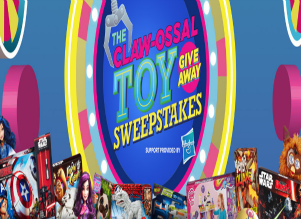 Disney Channel Claw-ossal Toy Giveaway Sweepstakes – Win Hasbro toys! Win over $800 worth of Hasbro toys! ENTRY LIMIT – Entries are limited to one (1) Entry per person/ Address per day, (regardless of whether one person has more than one Address or more than one person uses the same Address). ELIGIBILITY – Open only to persons, who are, as of date of Entry, three (3) years of age or older, legal residents of, and physically located within, the 50 United States or D.C. SWEEPSTAKES ENTRY PERIOD – Sweepstakes commences at 12:00 A.M. PT, November 4, 2015, and ends at 11:59 P.M. PT, December 3, 2015. ARV of Grand Prize: $874.78. 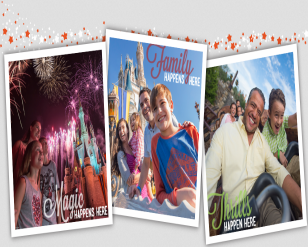 BLACK+DECKER Magical Vacation Giveaway – Win a trip to Disney World! Win a trip for 8 to Disney World! ENTER SWEEPSTAKES HERE – Black & Decker Sweepstakes page. ENTRY LIMIT – Limit of one (1) entrant per household and one (1) Entry per entrant per day during the Entry Period. ELIGIBILITY – This Giveaway is open only to persons who are legal residents of any of the 50 states of the USA or Washington, D.C., 21 years of age or older the time of entry in this Giveaway and have a valid USA driver’s license or other official form of personal identification. SWEEPSTAKES ENTRY PERIOD – The entry period of this Giveaway will be November 2, 2015 at 12:00 AM (midnight) Eastern Time (“ET”) through January 31, 2016 at 11:59:59 PM ET. PRIZES – Weekly Prize: The Weekly Prize is one (1) BLACK+DECKER 20V MAX* Lithium 4-Tool Combo Kit model #BDCD2204KIT (approximate retail value $175). Each Weekly Prize Winner should allow up to 8 weeks after returning his/her signed Winner’s Affidavit to RSM or BLACK+DECKER before the Weekly Prize is mailed to them. The Weekly Prize will be mailed to Weekly Prize Winner’s street address in USA (cannot mail to a p. o. box) via regular ground mail. Income and other taxes, if any, on the Weekly Prize are the sole responsibility of each Weekly Prize Winner. * – Maximum initial battery voltage (measured without a workload) is 20 volts. Nominal voltage is 18. 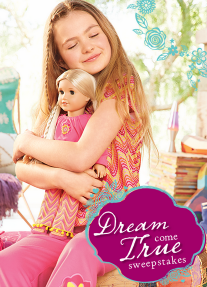 American Girl Dream Come True Sweepstakes – Win an American Girl doll & more! Win a BeForever doll & more (10 winners)! ENTRY LIMIT – Limit: Each participant may enter one time per day during the Promotion Period. ELIGIBILITY – American Girl Dream Come True Sweepstakes is open only to legal residents of the fifty (50) United States (and the District of Columbia) and Canada (excluding Quebec), who are at least eighteen (18) years old at the time of entry. SWEEPSTAKES ENTRY PERIOD – The Sweepstakes begins on June 22, 2015 at 12:00 a.m. Eastern Time (“ET”) and ends on October 31, 2015 at 11:59 p.m. ET. PRIZES – TEN (10) GRAND PRIZES: Choice of BeForever™ Doll and Choice of Matching Girl & Doll PJs; Approximate Retail Value (“ARV”): $205 USD.